Over the last couple of weeks we rolled out some nice updates in Gmail, improved on Google forms, added new mobile device security features and celebrated many new applications recently added to the Apps Marketplace. Enjoy! You’ve been able to add plain text signatures to your messages in Gmail for some time, but last Thursday we stepped it up a notch by adding rich text signatures, one of our most requested features. 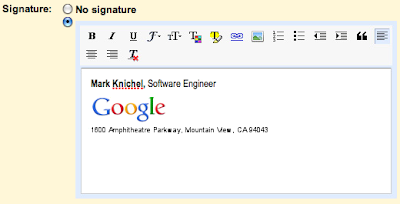 Now you can create signatures with different fonts, font sizes, font colors, links and images. 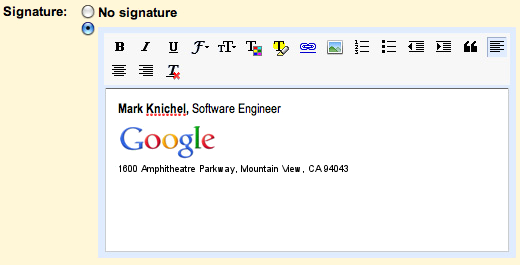 The feature also supports different signatures for different custom “From:” addresses that you’ve configured. Head over to the “Settings” page in Gmail to get started. Gmail has recently added some new interactive features, like drag-and-drop attachments and images, and new windows that “outlive” your original Gmail window. These features are possible thanks to HTML5, but until this week, Safari users have been left out. All of that changed on Monday, and users of Safari 5 can now enjoy these helpful HTML5 features, too. With Google forms (part of Google Docs), you can quickly create and send surveys to your contacts or publish surveys on the web. We started out offering simple one-page forms, but last week we made some big improvements to our logic branching capabilities. Now you can easily create multi-page surveys that adapt depending on how people answer your questions. Try it out for yourself in the form-based choose your own adventure game that we built. Businesses and schools using Google Apps often want the ability to centrally manage mobile devices that their users connect to Google Apps, and on Tuesday we rolled out several new device management capabilities. 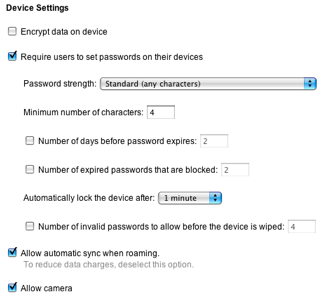 Organizations can now require devices to use data encryption, auto-wipe devices after a certain number of failed password attempts, require device passwords to be changed periodically and more. Some technology companies burden IT departments with software patches and fixes every month, but our cloud computing approach means that customers get improvements automatically with Google Apps. In addition to all the new features built by Google, this month we added 10 new applications from third-party software companies to the Apps Marketplace. Third-party apps integrate seamlessly with Google Apps and can be activated by administrators with just a couple clicks. More and more organizations are getting with the times and switching to Google Apps. Today we welcome Vektrex, Rypple, XAOP, Limbach Facility Services, Riley Chartered Accounts and tens of thousands of other businesses worldwide that have moved to the cloud with Google since my last update here. More universities are preparing to reopen their doors in the fall with new campus technology tools, too. We’re excited to have University of Minnesota College of Liberal Arts, Universitat de Girona in Spain and The College of St. Scholastica join us! I hope you’re making the most of these new features, whether you’re using Google Apps with friends, family, coworkers or classmates. For more details and updates from the Apps team, head on over to the Google Apps Blog.